Tomato and watermelon, it turns out, were made for each other. The fish was amazingly prepared. Course number 3 on its own would have been the best dinner I had in years. We drank with it a white, slightly sparkling Basque-country wine called Txomin Extaniz (2009), which itself was a revelation: the apple accent was so distinctive I almost mistook it at first for cider. The total price for two: about $2500. But when you net out the sunk costs of the round trip airfare to Madrid, train from Madrid to Barcelona, flight and bus from Barcelona to Donostia (San Sebastian) and hotels along the way, what’s left is the paltry 100 euros we paid for the Menu al Degustacion at Bodegón Alejandro in the old city. 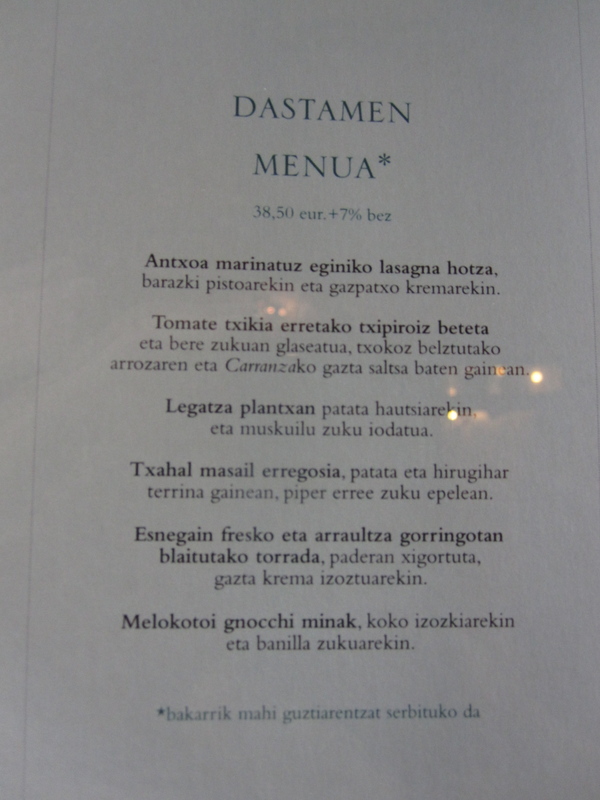 San Sebastian is a pescatarian’s paradise and this was the third of three outstanding experiences we had here. We were steered away from a Basque pinxto bar in Barcelona because we were told that we would be getting the real thing in San Sebastian. My advice: have your pinxtos in Barcelona or elsewhere and put SS to it’s best use. It may have an absolute advantage but it’s comparative advantage is the restaurant scene. I hereby rank this the best foodie playground in all of Europe for the astonishing density of incredibly high-quality, moderately priced menus. It is truly unbelievable how easy it is to walk into any generic restaurant here, without reservations, sit down and have a phenomenal meal. And if you get bored of that it has more than its fair share of Michelin 3-stars too. Sounds wonderful Jeff! So glad you are enjoying the food. (and everything else)!